Another most advanced weapon conceived by the Germans in WW II was the Panzerabwehrrakete X-7 (“tank defense rocket”) anti-tank guided missile, nickname Rotkäppchen (“little red riding hood”), project number 8-347. Developments for a guided AT missile begun as early as 1941 when BMW (the car company) offered the weapon to the armís weapons bureau. Because of the then generally good military war situation the army wanted to save the projected development costs of 798,000 RM. In 1942 Dr.Kramer of the German research institute for aircraft developed rocket engines for weapons that resulted in the X-series of guided bombs and precision weaponry of which the X-7 was the smallest family member. The first prototype was followed by a larger production model with a changed detonator for the shaped charge of 2.5 kg. The back part of the main body (length 46.5 cm; diameter 15 cm)contained the two-stage solid fuel rocket engine 109-506 developed and made by the company WASAG. The wings were swept forward and had wingtips which housed the guidance wires, wingspan was 60cm. The small elevator/steering rudder assembly was set off 13.2 cm of the main bodís axis. Total length including the protruding detonator cap (diameter: 3.8 cm) was 95cm. The fully loaded Rotkäppchen weighed 9kg. The missile was to be launched from a start rail tripod that was 150cm long and weighed 15kg. The missile’s rocket engine was ignited with a 300V battery. This fired the 2g gunpowder positioned in the two hollow half rounds of the gyro stabilizer. The explosion gases exited through two tangential openings and immediately brought the gyro to operating speed. Then the 3kg of propellant of the first stage of the rocket engine were ignited. They developed 68kp thrust and accelerated the missile to its flight speed of 98m/s in 2.5 sec. In flight the X-7 rotated around its axis at a rate of two rotations/sec. Guidance commands from the gunner were transmitted over the two wires, one for longitudinal and one for lateral corrections. A delay mechanism let the steering rudder of the elevator only work when it was in the right position for the respective command, in other words, the elevator worked both as a (longitudinal) elevator and a (lateral) rudder. Guidance was achieved through optical tracking of the small tracer in the rear of the rocket that was to be kept superimposed over the target by the gunner’s commands until it impacted (a method still in use today and known as CLOS for command-line-of-sight). The second stage of the rocket engine developed a thrust of 6kg for 8sec. This sufficed to keep up a speed of over 300km/h and reach a range of 1200m. The shaped charge warhead was strong enough for all known tanks of that era. A trial was undertaken on September 21st 1944 with seven X-7 missiles. Because of the unusual and unfamiliar flying characteristics the first four weapons had ground contact after some distance and therefore crashed. On the next two the rocket engine exploded on the way to the target. The last Rotkäppchen flew all the way and hit the target tank at a range of 500m dead center. Only about 300 X-7 Rotkäppchen were completed; mass production was planned and had already started at the companies Ruhrstahlwerke in Brackwede and the Mechanische Werke in Neubrandenburg. Many almost finished weapons were captured by the allies. It is unclear whether the combat trial at the front took place or which results it had. 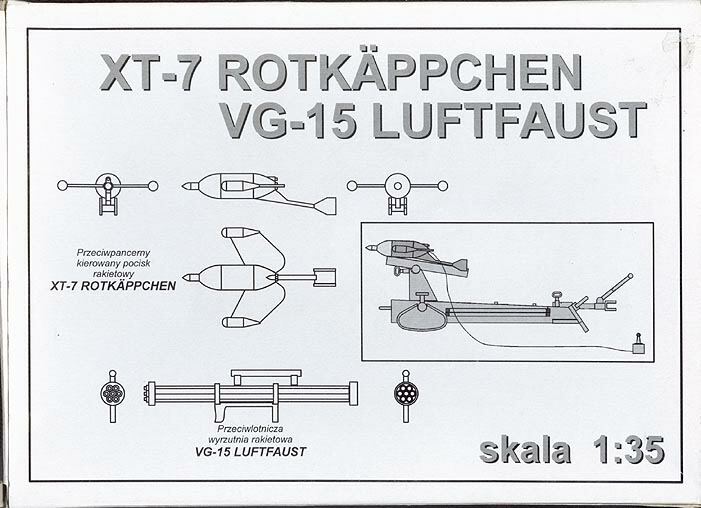 Improvements of the X-7 Rotkäppchen were the Steinbock which used infra-red transmitting of the guidance command and therefore didn’t require the wires. 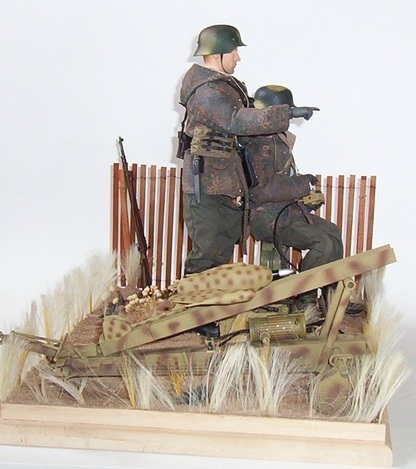 An automated tracking device was the Pfeifenkopf or Pinsel project. It utilised a machine that computed the changes in angle of the two sighting devices – one was to be aimed at the target, the other at the missile- into commands for the missile. This mechanism was further automated in the Zielsuchgerät (“target acquisition device”). By using an image recognition device called Ikonoskop the missile was to seek its target through its own optical sensor that compared the image data from the aiming device with the data it received from its own optical sensor. Besides these avionics and electronic equipment, other long range ATGMs were the Rochen-600, Rochen-1000 and Rochen-2000 for ranges of 500m, 1500m and 3000m respectively. Another project called Flunder utilized many parts of the Panzerfaust including its warhead and using its launch tube for the rocket engine. None of these projects were completed.